There is good news and bad news. The good news is that the opportunity for higher manufacturing margins exists in the ETO (engineer-to-order) space; the bad news is that poor job quoting processes often consume that competitive advantage, even generating an unprofitable manufacturing project. Approximately 55 percent of all North American manufacturers are ETO, yet very few know it. They refer to themselves as custom manufacturers or manufacturers within a particular sector. Due to customer demand for customization there has been a 20 percent increase in ETO manufacturing over the past twelve months. These are custom manufacturers rather than repetitive manufacturers. Thanks to new lean manufacturing best-practice technologies, the quoting process has arrived at the doorstep of a lean journey. While it seems like an obvious segue from the shop floor, the quoting, bidding, and engineering modifications needed, have been overwhelmingly ignored. Operations managers have lean teams and have squeezed maximum productivity and throughput; they have eliminated waste in the material flow, production, and labor utilization. Without abandoning the notion of continuous process improvement, Theory of Constraints (ToC) would advise where the most value-added process can be captured in the industrial operation. The most immediate and critical impact on the bottom-line can be found in the sales process. ATLATL's QuoteBooks VCPQ platform provides the more efficient way to configure and sell manufactured products. Due to the complex engineering schematics, numerous client iterations, and project changes, ETO quoting has often taken months. Costly and no guarantee of a PO, customer acquisition costs consume time and erode margins (even if the quote is accepted). Purchasing managers, IT professionals, and engineering sales executives have longed for a shortcut. Fast and easy quotes have been impossible until now. Thanks to an open API (Application Programming Interface) with mobile-friendly access, unlimited storage per user, and a secure cloud-based platform, these new technologies are reducing project quoting time by 90 percent. 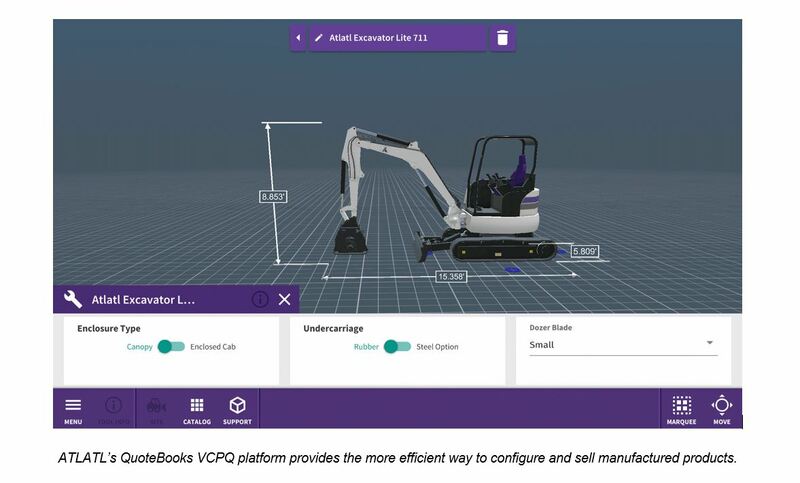 Enterprise-wide manufacturers are now able to interact with vendors, suppliers, engineers, and purchasing managers to construct complex project quotes in real-time. Whether using a rules-based 2D configurator with pre-rendered drawings or a 3D product configurator with dynamic drawings, there are no products nor engineering rules too complex for the best-in-class patented rules engines. Since this sales quoting process can easily integrate with most CRM (Customer Relationship Management) and ERP (Enterprise Resource Planning), there is no need for double data entry (saving time and eliminating the introduction of new error introductions). Integration with CAD solutions is part of these new quoting technologies. As the former spokesperson for the ETO Institute, the number one reason manufacturing and industrial engineers left their positions was the frustration in the sales quote process. New technology that uses rules-based and step-guided processes to speed past the bottlenecks of ETO quotes eliminates that frustration and boosts both employee engagement and retention. Ultimately, these easy-to-use quoting platforms are facile and agile for Millennials and younger because all data can be accessed using a simple, intuitive mobile app. This enhances the fun-factor in work. When all involved in a project quote are able to visualize the product they are buying real-time in 3D on mobile devices, the idea of waiting for hand-drawings is simply unacceptable. The time saved in real-time quotes creates a very rapid ROI for these solutions. The leader in this lean manufacturing quote technology is Atlatl Software because based on a third-party Forrester survey their customers reduced $1.2M in the annual cost of order mistakes. Additionally, the survey revealed 104 percent annual ROI from reduced costs of mistakes alone. Finally, the survey shows a 304 percent average return on investment per customers.